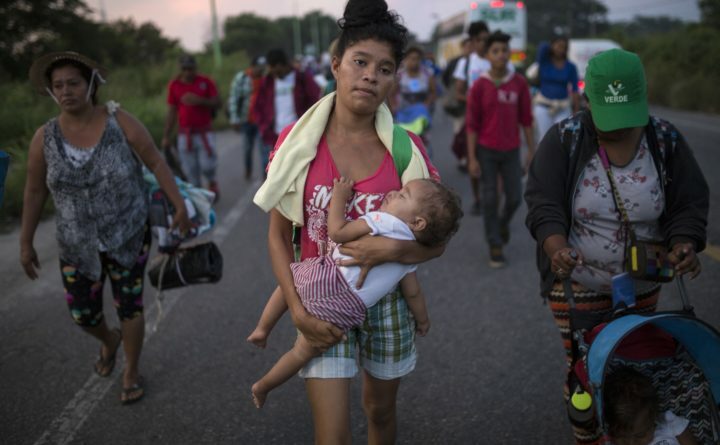 Maria Gomez, 22, carries her son David Moises, 1, as the thousands-strong caravan of Central Americans migrants hoping to reach the U.S. border moves onward from Juchitan, Oaxaca state, Mexico, Thursday, Nov. 1, 2018. Thousands of migrants resumed their slow trek through southern Mexico on Thursday, after attempts to obtain bus transport to Mexico City failed. A caravan of terrorists and criminals is not headed to America to invade our country. Don’t take our word for it. Listen to Fox News anchor Shep Smith. Based on Fox’s own reporting, a large group of immigrants who are walking toward the United States is in southern Mexico, a two-month walk from the U.S.-Mexico border. If this group is like previous ones, a few hundred will make it to the southern U.S. border. There they will wait as their asylum applications are considered by U.S. officials. Most will be turned back. Smith’s assessment, of course, is in sharp contrast to the fear and misconception that President Donald Trump has stirred up, conveniently just before Americans head to the polls for the midterm elections. Trump has deployed more than 5,000 U.S. troops, with helicopters and spools of razor wire, to the Mexican border, although the caravan remains 1,000 miles away. He later said he’d send 15,000 troops to the border — that’s more than are currently deployed in Afghanistan — which caught the Pentagon by surprise. Trump continues to talk about an “invasion of our country,” even though Pentagon documents say that only a small percentage of the refugees will make it to the U.S. border. Trump and other Republicans have darkly warned Americans that the caravan includes terrorists from the Middle East. This is not true. In fact, thousands of Central American migrants, including many children, are trying to make the 1,000-mile trek to find better opportunities and avoid persecution. Many will never make it to America. They’ve wrongly spread rumors that the members of the caravan are paid by George Soros, a billionaire philanthropist, who is Jewish and is a frequent boogeyman of the far right. Such a conspiracy theory fueled Saturday’s deadly attack on the Tree of Life Synagogue in Pittsburgh. The shooter had a longstanding hatred of Jews but was enraged to see that Jews were helping refugees. Welcoming newcomers is a core tenet of Judaism — and Christianity. The migrant caravan is the Ebola scare of the 2018 election. In 2014, Republicans ginned up fears of Ebola to scare voters into supporting their law-and-order candidates. Maine was at the epicenter after a nurse who had been exposed to the virus was detained in Newark, New Jersey, in late October. Then-New Jersey Gov. Chris Christie, then the head of the Republican Governors Association, allowed the nurse, Kaci Hickox, to return to her home in Fort Kent, where she was quarantined, even though she never tested positive for Ebola. Gov. Paul LePage demonized Hickox and tried to restrict her movements. An Aroostook County judge ruled that the state had not shown that such actions were necessary. In his order, the judge noted the irrational fears of Ebola and “misconceptions, misinformation, bad science and bad information being spread from shore to shore in our country” about the virus. Days later, LePage was re-elected. Soon after that election, politicians stopped talking about the illness and media coverage of Ebola essentially evaporated. Fear is a powerful motivator. That’s why politicians like Trump rely on it.